dont you just love looking through old photos?? so many memories spring up, and they're usually pretty small things. yesterday i went to my dad's, after photos of our old cat, Ginny. 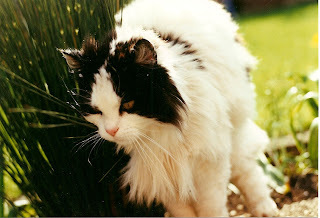 she was a kitten when i was a baby and lived to be 16. she used to sit outside my bedroom window, miowing to come in at 6 in the morning! 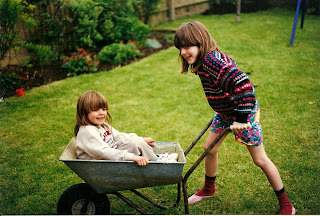 also found in the photo pile was this classic of me and my sister. look at the fetching pattern clashing! my mum is a bit down at the moment. she had to have her achilles tendon removed and a new tendon, muscle and blood supply grafted from her big toe. unfortunately she now had an infection in the toe site and is feeling down because she cant do anything on her own yet. she spends all day either on the sofa or in bed and is really bored and frustrated. *sigh* poor mummy. continued with the Heroes dvd session last night, only 5 more episodes to go. *gasp* at mr linderman, *sigh* at claire's grandmother, *argh! * at sylar, suresh and peter! i would also like to say a (very) belated congratulations to fellow cropper sandie for having a Lo accepted into the Basic Grey gallery.